On July 31st 2018 finished the 8th IBCA World Team Chess Championship for Blind and Visually Impaired people in Sofia, the capital of Bulgaria. 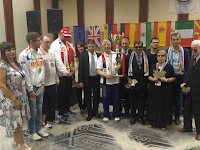 On the closing ceremony in hotel Marinela the organizers - the International Braille Chess Association (IBCA) and the Bulgarian Federation “Sports for Visually Impaired” has invited again interesting guests - public persons and artists. Thanks giving speeches gave the chairman of the International Braille Chess Association (IBCA) Jadhav Charudatta from India. He expressed his satisfaction of the work of the local organizers and of the hospitality of hotel Marianela and thanked to the arbiters' team for their support. He congratulated the winners - Russia, Poland and Ukraine and all the teams for their sport and team spirit. He thanked to the vice president of FIDE for the support and underlined the importance of the FIDE solidarity in the organization of the championship. The Chairman of the Bulgarian Sports Federation Sport for the Visually Impaired People, Ivan Yanev thanked to all institutions, associations, foundations, unions, sponsors and to all people and volunteers who took part in the organization of the 8th World Team Chess Championship for Blind and Visually Impaired in Bulgaria. He thanked to all media partners of the forum. Greetings gave also Angelina Angelova, PR director of Victoria group and administrative director of Marinela group. 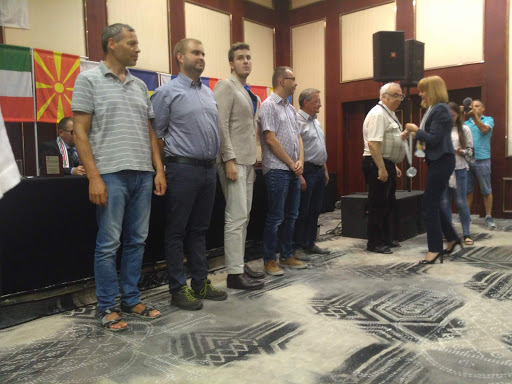 The mayor of Sofia municipality - Yordanka Fandakova greeted all the guests and organizers. She expressed satisfaction that Sofia as European capital of sport in 2018 hosts the 8th World Team Chess Championship for Blind and Visually Impaired and underlined the importance of sport and chess for the social activity and health of people. The official part was followed from the beautiful songs of the Bulgarian signer Lusi Dyakovska. In the prize giving part the winners were prized with cups, medals and plaquettes. At first with golden, silver and bronze medals were awarded the players with board prizes. 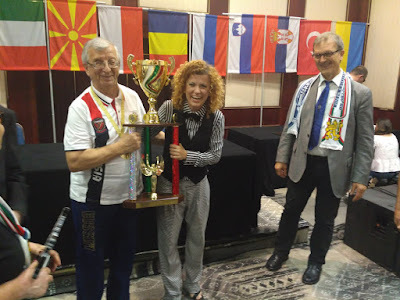 The chief arbiter Dr. Radislav Atanasov gave the awards on the 5th chess board - the third place is for Aleksander Ursic from Slovenia; second place is for Igor Shepelev from Ukraine and the first place took Ruslan Draganov from Russia. 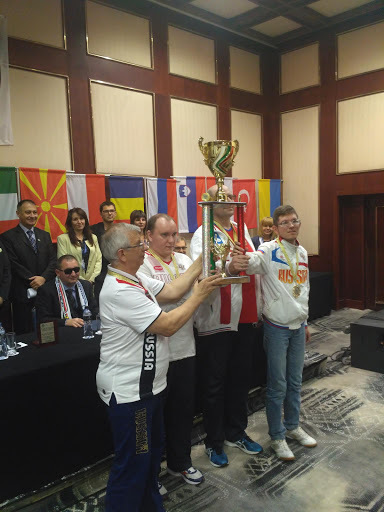 The prize winners of the 4th chess board were awarded from the chairman of the Bulgarian union of the blind - Vasil Dolapchiev and Ilia Lalov the chairman of the Bulgarian paraolympic association - the third place Mihai Dima - Romania, second place is for Evgeniy Suslov - Russia, and the first place took Jacek Stachanczyk - Poland. The prize winners on 2nd chess board were awarded from the FIDE viceprezident - the third place is for Ugur Deniz - Turkey, the second place took Stanislav Babarykin - Russia and the first place is for Adam Czajkowski from Poland. The prize winners on 1st chess board were awarded by the IBCA prezident Jadhav - the third place is for Chriss Ross- England, the second place took Alexey Smirnov - Russia and the first place is for Marcin Tazbir - Poland. The president of the international website ChessBomb for live broadcasting chess tournaments Borislav Rizov gave premium accounts for the ChessBomb site as the additional awards for the 3 most attractive games in the tournament:Aryan B. Joshi and Kolpakov Vladyslav in round 1, Tuka Oleg and Nizam Rasim in round 2 and Czajkowski, Adam and Babarykin, Stanislav in the final 9 round and 2 prizes for fair play of Benson, Paul J and Pennington, Graham for from England. 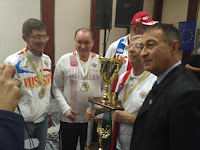 In the next part of the prize giving ceremony were given the cups for the teams. 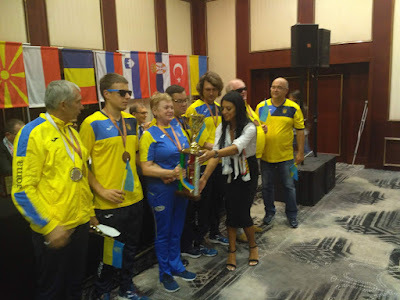 Angelina Angelova,PR director of Victoria group and administrative director of Marinela group prized the Ukraine team with the third place cup, Yordanka Fandakova the mayor of Sofia gave the big prizes - second place cup to the team of Poland and the cup of the 2018 world champion - the team of Russia. The golden medal took the team of Russia. The Poland team took the second place. The Ukraine team took the third place. ChessBomb would like to thank to organizers for choosing us to broadcast live the whole championship and to make it visible in internet for the society and for the chess world. We also would like to thank to arbiters for helping us in recording the moves during the play. 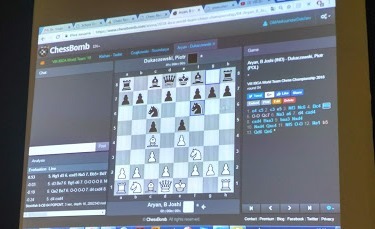 Every move in the event was broadcast on the website ChessBomb. We also thank to GM Alexander Delchev for all comments, analysis and interviews he made on our Yotube channel. We congratulate the winners and all the participants and wish them new successes. 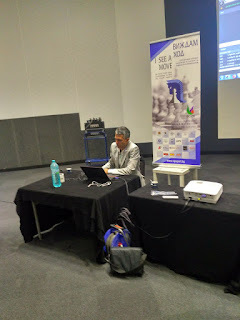 Interesting reviews and commentaries were offered from of our guests from ChessBase India.